Details: UK Version. Every four years, football takes centre stage as 32 nations compete for the ultimate sporting prize: the FIFA WORLD CUP™. This year things really heat up as the world’s footballing elite head to Russia in hope that they will be the ones who raise the trophy! 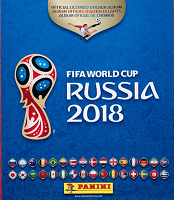 Panini are proud to bring you the only 2018 FIFA World Cup Russia™ Official Licensed Sticker Collection for this celebrated event. This stunning collection features all 32 teams presented with eye-popping graphics and amazing images of the world’s highest profile soccer superstars. There are 682 stickers to collect including 50 special stickers to look out for. Collectors can kick start their collection with a starter pack which includes an album and 26 stickers!